My kids stared at the screen. They picked up their sandwiches and forgot to take a bite. They took a bite and forgot to chew. Worried looks froze on their faces. Their aunt sat between them on the sofa, and offered a hand to cover their eyes through the scary parts (they peeked through her fingers, and their own). Twenty-one years haven’t changed the fact that ROUSes are pretty badass. It was good to see what I saw in my living room this afternoon. My sister and her niece and nephew, cuddled together on the sofa watching a movie that both of us – the sisters – have loved for far longer than my children have been alive. That said, I’m very much at ease with my sister here, and happy to share the same space again. I forget sometimes how long we’ve had each other’s backs – forty years is no small thing. There’s a shorthand in that comfort, in knowing each other’s stories. 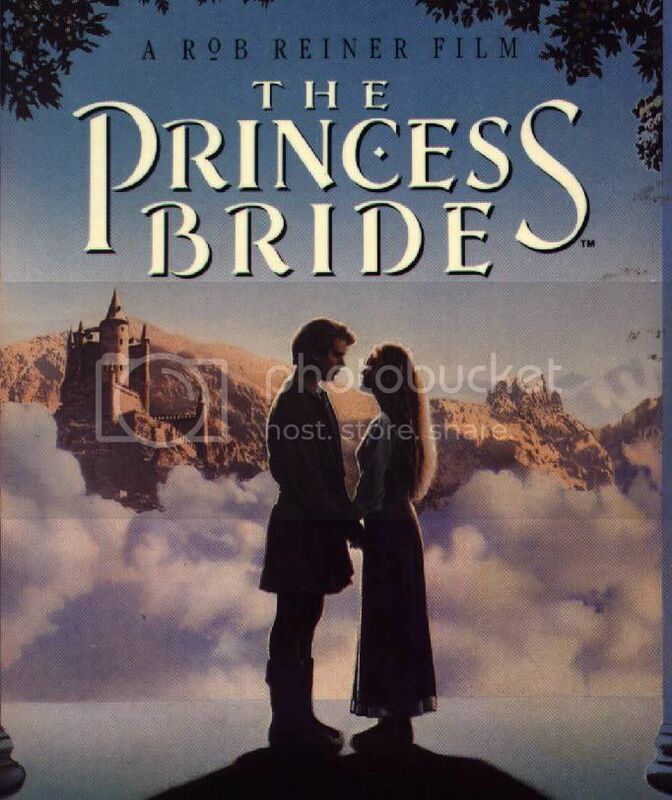 This afternoon, I thought back 21 years to when The Princess Bride came out (I’m sure I didn’t see it until at least a year or two later, on video). Our lives were so different then. In 1987, I graduated from high school and left home for college in another state. Ducky had been gone from home for four years by then. The situation back at home was a mess. We were versions of ourselves that were both simpler and more complicated. Unformed in some ways, and far beyond our years in others. We were not most of the things we are now. Back then, I couldn’t have imagined that one day we would end up with the lives we have. I couldn’t have known that the possibility of these two beautiful children lay waiting inside me. I started thinking about the labels all of us use to describe ourselves – mother, writer, doctor, librarian, teacher, father, wife, husband, sister, brother, friend, daughter, caretaker. There are times when we need more than anything to stand in front of that one shiny mirror, to see the best part of ourselves. It’s a great feeling. But who can spend all their time like that? Jobs or children or a mortgage or parents often need our attention and care first – stronger, immediate needs, and so we take charge of those things, as we should. We step into the action of our lives and are in turns the swordsman, the thinker, the giant. The long-lost love or the one in need of rescue. A princess. The farm boy. The miracle worker. We become many things, open ourselves wide so that the people we care about can find what they need to see in us, the image of us that they expect to be true so that life makes sense to them, too. There’s no getting around that, if we want to live among the people we care about. We need things from each other, and we need to feel like we have something to offer. It’s just the way of things, the barter, the reward. At the end of the movie when the grandfather says “As you wish,” my daughter (she was snuggled in next to me by then) gasped and then let out a soft “Awww…” Over on the sofa, my son sat next to my sister, as comfortable with her as if no time had passed since he saw her last. And everything in that room, in that moment, the meld of past into present, was exactly as I wished. There were some funny things about the day. If you click here, my sister will tell you the one that really made us laugh. I’ve had similar moments, stepping back to sort of float around the ceiling of the room looking down on all the personalities ensconced there amid down pillows and plush sofas, eyes fixed on some collective entertainment that we are happy to share. And I am always thankful for that type of moment because there are so many others in a day, in a month, in a year that don’t reflect that same certainty and comfort. Take them while you can, I like to say. Just seeing the illustration at the top of this post took me back – reminds me of my high school “husband” and the intense feelings of love that only young, first loves know. I’m glad you had such a special moment with your sister and the kids. that movie rocks my world. and, lately, i have been sort of surprised when i notice my mother role. i need to watch that movie again. so glad you had such a great afternoon…. I love that film, almost as much as I love the book. I think we started watching it with the kids when they were about 6 and 8, and I read it to them last year, because there’s so much in the book that never made it to the screen (though the film is perfect, as is). Looking back is a symptom of age, I’m afraid. For years I never understood why my dad would get all depressed during the holidays – it really took the fun out of things – but as I get older and more people I love (or even didn’t love, but played a part in my life) leave this life, I find myself doing the same, only unlike him, I actually talk about it. But THAT is a subject best left unexplored, at least in your comment section anyway! So glad you and Ducky are having such a lovely time together! Aw – I just got a call from my sister. We were supposed to have Thanksgiving together, early – the Sunday before – so we could hang out despite going elsewhere on the actual day. She just found out she was picked for a teacher’s workshop that can help her pass the boards… and it’s on that weekend. So proud of her, but so sad we can’t hang out anytime soon. With your writing, I was ensconced right in the middle of that living room, amid the love and comfort – thank you for that!! Surely one of the best movies of all time; and one I watched incessantly with friends in college, so I have lots of memories to go with it. SIsters you love and who love you back are invaluable. I’m lucky to have three. I adore that movie. I can’t wait until my kids are old enough to appreciate it as much as I do. And so know what you mean about casting yourself in a different light around family. I tend to fall into the bossy oldest sister role, which melds nicely with the bossy older mother I’ve become. San Diego Mommas last blog post..What the Hell? The Princess Bride! Wow, that takes me back. I like the part where the guy drinks the poison and is talking and just suddenly falls over. Actually there are a lot of funny parts. Oh, and “fartitas” – that was a good one! Wonder what the word really is? Man, I love that movie – just watched it (again – for the the thirteenhundreth time) last week. Isn’t it wonderful when things happen and looking back you recognize perfection in the moment? It’s even MORE special when you recognize that perfection IN the moment. You and your sister need to live closer together – sounds like you’re having a blast. That is awesome. And also, stop that rhyming now I mean it, does anybody want a peanut. Ah. My favorite. I clicked on ‘a mess’ and read through it…parts 1,2, and 3. I was so moved by your story. Thank you for sharing it. I think I’ve said this (or something like it) in a previous comment – you have an incredible way with words. I find myself taken in by your writing. I love the princess bride. I’m looking forward to watching it with my kids. They’re still too young for the scary bits. It sounds like a perfect visit. Of course Princess Bride is an amazing movie. I really needed to read this. I’ve been mostly dead all day. Cocos last blog post..I’ll Take Starsky, You Take Hutch. This is a wonderful post! I’m so glad you had such a special day with your sister. And I LOVE that movie. I can’t wait to sit down and watch it with my girls in a few years. Oh I love that one! Awwww. I love that movie…so do my friends, son & daughter, and sister. I loved this post! What you said about how many roles we play and letting others see in us what they need. So true. And I love how families mesh in those times. Read the book when you have a chance. I’m glad you children now are fans as well.